The European Central Bank (ECB) said it will keep interest rates at their record low “at least through the end of 2019” at its monthly rate setting announcement yesterday. The market had long anticipated a rise in interest rates in the second half of this year from the all-time low levels rates were slashed to during the financial crisis. But with real growth in the Euro area flat-lining and with even Germany threatened by recession, the ECB had already backtracked on those plans. The anticipation that official interest rates will remain low for longer is already benefiting consumers here. This week, AIB, the largest mortgage lender in the State, surprised the market with cuts to its fixed-rate mortgages. That was in defiance of the expectations of most commentators and rival banks – notably Bank of Ireland, who had predicted the end of mortgage rate reductions. AIB cut its one, two, three, four, five and seven-year rates, and introduced a new 10-year rate. Most new buyers are opting for fixed rates. AIB had been seen as offering less attractive fixed rates than its competitors, but the latest move will position it to take on its rivals. 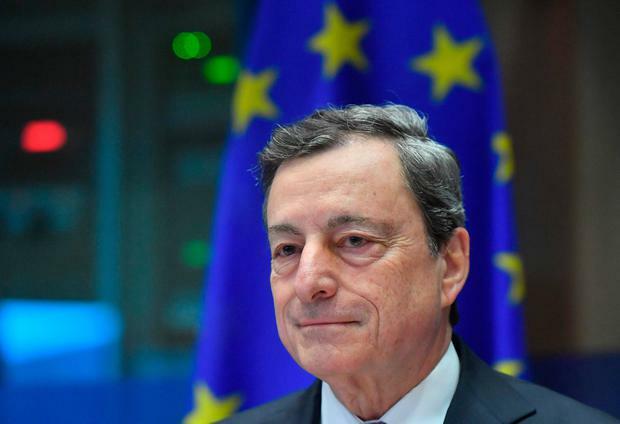 Underpinning the interest-rate boon though is the Euro area’s ongoing economic weakness, which has been “somewhat longer lasting” than anticipated, ECB president Mario Draghi admitted at a press conference yesterday. The ECB’s deposit rate, currently its primary interest rate tool, remains at -0.40pc while the official main refinancing rate stands at 0.00pc. Mr Draghi, who welcomed incoming ECB chief economist Philip Lane to the bank’s executive board, confirmed that policymakers are still considering other measures to rev up the wider economy, but has not landed on a plan yet. “We need further information that will come to us between now and June,” Mr Draghi said. Meanwhile, UK economic data surprised on the positive side. The economy there unexpectedly grew in February, boosted by manufacturers rushing to meet orders from clients who are stockpiling goods ahead of Brexit, official data showed. Elsewhere, Dublin is already the seventh most expensive city in the world to build but construction costs could rise another 7pc this year, according to a new survey. Consultants Turner and Townsend’s ‘International Construction Market Survey’, published today, shows that the cost of building in the capital stood at $3,245.10 (€2,878.08) per square metre, a level that places it third in Europe behind only London and Zurich. “The upturn has attracted a wave of large office and residential projects in the Irish capital, and the early spoils of Brexit have added further momentum as some major occupiers look to relocate from London,” said Mark Kelly, the company’s managing director for Ireland . Major projects getting under way include the Dublin MetroLink, St James’s Gate urban quarter redevelopment and the fit-out of Facebook’s new HQ. Overall, two-thirds of the markets surveyed by Turner and Townsend report a labour shortage. In Ireland, this has pushed the average hourly wage up 5pc in the past 12 months to €35.70, the consultancy said.